UV-tubes | SSWM - Find tools for sustainable sanitation and water management! The bactericidal effect of concentrated ultraviolet (UV) light is used in many areas and in many set-ups. For drinking water treatment, simple, commercially available UV tubes can be used to kill pathogenic microorganisms in the drinking water. Such UV tube water disinfection devices are an effective, low-cost and simple mean for a very rapid disinfection. They generally consist of a pipe, through which water slowly flows, and in which an UV light bulb is installed, which can be run on electric or solar power. There are many ways to design UV tubes devices and they can be used at household, community or institutional level. Even though very effective, however, chemical or physical pollution (e.g. salinity, heavy metals turbidity) cannot be treated and in opposition to chlorine, there is no residual disinfection effect. The bactericidal effect of concentrated ultraviolet (UV) light has been known over many years and is used in many areas and set-ups. The first use of UV light for drinking water disinfection has been reported to be in France in 1910. 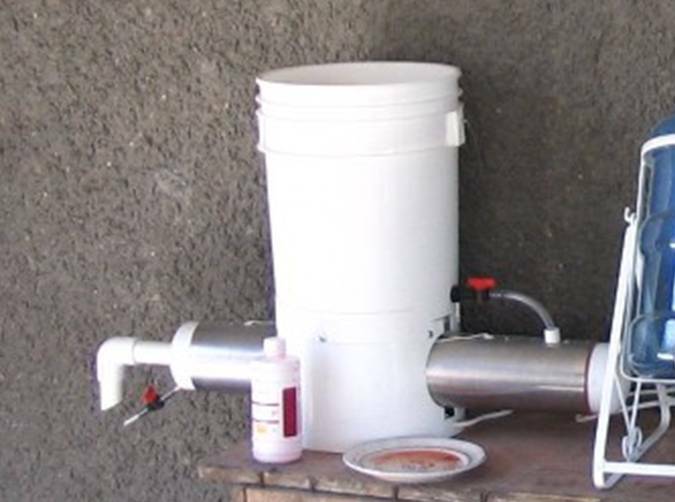 With the recent development of the UV tube, using locally available components, this technology is now a viable household water treatment method (CAWST 2009). Facing the challenge that disinfection by-products (DBPs) are formed during chlorination of water containing high organic contents, simple physical instead of chemical disinfection methods, such as UV tubes have gained in interest (U.S. EPA 1999). A typical UV system provides a flow path surrounding a UV lamp, structured to provide close proximity of the water flow along the length of the UV lamp all by preventing direct contact. The UV tube is basically the same as a commercial fluorescent bulb, except that it lacks the phosphor coating and the glass exterior is replaced by fused quartz. This means the bulb emits mostly UV light. UV light is generally defined to be wavelength of electromagnetic radiation shorter than 400 nm and is further divided into UV-A (315-400nm), UV-B (280-315nm) and UV-C (200-280 nm). UVA and UVB are responsible for sun tanning and sunburning. UVB is partly filtered out by the atmosphere and only a few percent reach the earth surface. This is good, because UVB light can be directly absorbed by DNA, where it would induce cellular damage. UVC also penetrates cells and damage the DNA, but it is almost entirely filtered out by the ozone layer. The UV tubes used for disinfection do contain the whole spectrum of UV light, including the UVB and UVC. The light, when it reaches microbial cells leads to damage of the genetic material (DNA), rendering them unable to replicate. The bulbs are suspended inside a larger tube in a covered channel. Water enters at one end and flows through the outlet at the other end. While the water flows through the tube, the UV light emitted from the bulb inactivates the microorganisms. The inactivation is directly related to continuous UV dose and depends on the intensity of the UV light and the duration of UV exposition. The height of the outlet determines the depth of the water in the tube and thus the hydraulic retention time (HRT, CAWAST 2009). In theory, the hydraulic retention time is equal to the exposure time of the microorganisms and should be designed, depending on the bulb intensity, to achieve a sufficiently long contact time for all microorganisms to be inactivated. For the calculations of the HRT, the intensity of the bulb may be adjusted according to the water depth of the farthest point away from the light source as the UV light is attenuated as it penetrates the water. UV tubes are effective in inactivating most pathogens, including bacteria, viruses, and cyst forming protozoa such as cryptosporidium (CAWST 2009). Yet, the effectiveness depends strongly on the UV dose. UV tubes are not effective for all pollution other than microbial (chemical and physical pollution) and there is now residual disinfection effect during storage of the treated water. The efficiency of UV light for bacterial inactivation is lowered by the presence of organic matter, iron, sulphites, and nitrites. Turbidity can also interfere with UV radiation, protect microorganisms from inactivation and serve as a food source for re-growth after the disinfection step. Therefore, it is common for UV tubes to incorporate a pre-filtration step, such as a settling unit. Operation and maintenance of UV tubes is generally low, provided that there is a more or less continuous source of electricity to run the bulb. Once the system is installed, the user needs to make sure that the theoretical flow rate of the water and the corresponding HRT are respected and that the bulb is working correctly. If the bulb becomes dirty, it needs to be taken out and cleaned to maintain the light emission intensity. The systems have generally a long life spam, but bulbs should be replaced at least once every 12 months (CAWST 2009). During any maintenance activity, however it is important that operators or users protect their skin and eyes from the UV radiation as it is also damaging for human cells. Ultraviolet is being widely used in the water supply systems for disinfection and has a potential to kill most bacteria, viruses, protozoa or helminths. Though, a more or less continuous energy supply is required and the system is not suitable for removing chemical contaminants or turbidity. There is also possibility of re-contamination during distribution or storage of the treated water as there is no residual disinfection effect. However, as it is only a physical treatment, there is low risk for the formation of toxic disinfection by-products (DBP). The UV tubes can be produced with locally available material and be installed at household, community or institutional level, as long as electricity is provided. ANDREW, R. (2005): Ultraviolet Water Disinfection: It’s All About the Dose. This publication contains laboratory and field studies to characterise the UV- tube performance at flow rate of 5L/m. It presents the UV tube as a promising technology for treating household drinking water at the point of use. BROWNELL, S.A. ; CHAKRABARTI, A.R. ; KASER, F.M. ; CONNELLY, L.G. ; PELETZ, R.L. ; REYGADAS, F. ; LANG, M.J. ; KAMMEN, D.M. ; NELSON, K.L. (2008): Assessment of a low-cost, point-of-use, ultraviolet water disinfection technology. In: Journal of Water and Health: Volume 6 , 53-65. A simplified and easily understandable factsheet on UV tubes. WOLFE, R. L. (1990): Ultraviolet disinfection of potable water. In: Environmental Science and Technology: Volume 24 , 768-773. Investigation of UV light emitting diodes (LEDs) as a substitute for conventional mercury lamp for a point of use disinfection option with performance and economic evaluation. This document shares information on UV introduction, mechanics of disinfection, Ultraviolet dose calculation, estimated lethal dose for microorganisms etc. A 2-page factsheet containing information on features, design suitability, operation, maintenance of UV drinking water disinfection. Factsheet summarizing the process, advantages, limitation, monitoring, and operation of UV disinfection. This master thesis researches UV tube performance, effectiveness and optimization of design at Laboratory (Renewable and Appropriate Energy Laboratory at UC Berkeley) and in the field (near Patzcuaro, Mexico). Pilot study on UV tubes with a new design in Mexico, developed by researchers of the University of California Berkeley. This paper summarises results from field tests with UV-tubes. Power point presentation focused on UV disinfection theory, working mechanism, advantages of UV system with Trojan’s UV disinfection technologies. LEINBERGER, J. Disinfection of drinking water with Ultraviolet light. Trojan Technologies Inc. Presentation on different designs of UV tubes with field experiences in different countries of the world. A paper containing frequently Asked Questions on UV light water disinfection. Performance, benefits and drawbacks, costs and some resources about UV tubes (and other household water treatment methods) are shortly presented. This is the homepage of the UV tube centre, at the University of California, Berkeley, where the technology has been initially developed. This report provides information on UV tube design, concept and presents research on different dimensions of UV tubes, such as effectiveness, tracer studies, bulb studies, and performance. It also contains experiences from different countries.